The time has finally come to start getting ready for classes, and even though I'm not really using Canvas to do anything different, migrating all my "quizzes" (student self-reporting of grades) is a chance to rethink a lot of little details. So today I redid the basic weekly template for my classes... and I am really happy with how it turned out. You can see how far I have gotten here: Week 2. 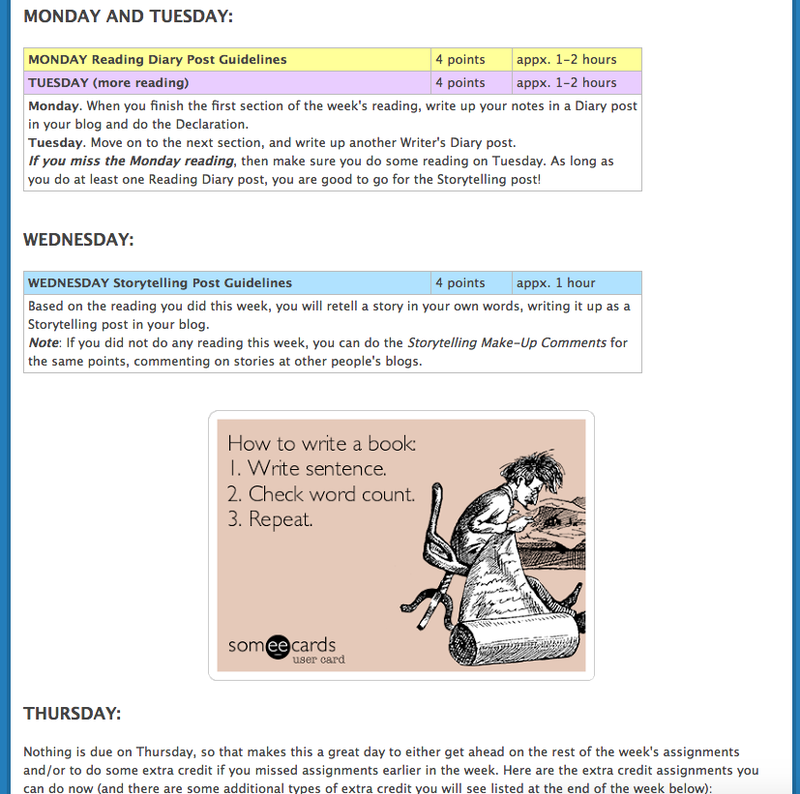 I've tried to make the workflow more clear to the students, and one way I did that was by inserting a "thought widget" that displays a random graphic about reading or writing at the split between the two halves of the week: reading and storytelling on Monday-Tuesday-Wednesday, followed by the project and peer interaction at the end of the week. Here's a screenshot of how that looks: I really like how it is something fun (surprise!) and also functional, helping to reinforce the sense that the week comes in two distinct halves. There are 60+ images in the widget, so that means students won't see a lot of repetition even if they come to this page several times each week. 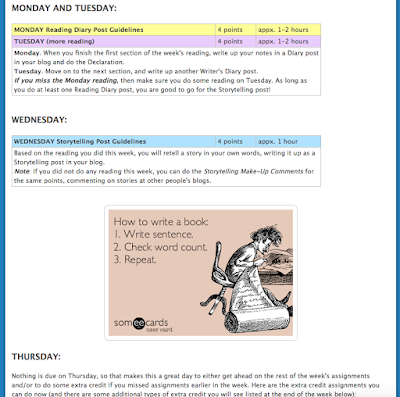 I clone this page for all the other weeks, tweaking it as needed for special things that pertain to any given week (changes to a specific assignment, holidays, etc. ); if it is still looking good to me tomorrow, I'll put in links to the assignment pages and start building the Canvas Declarations. And then... I'll be ready to clone! Give the page a click and see what comes up for you! The graphics all come from the three support blogs for my class — Growth Mindset, Learning by H.E.A.R.T., and Writing Laboratory — which means the students will run into them elsewhere, either in the work they do at those class blogs and/or in the class announcements where I often feature this type of motivational content. Since I had the graphics already prepared, creating the widget just took a few minutes; I use RotateContent.com, a free tool by OU genius alum Randy Hoyt. Although I've had my own domain since back in 1999 (MythFolklore.net), I did not have https until I got a domain through CreateOU. The guys at Reclaim Hosting make it so easy to set up https on a subdomain, and that is exactly what I need for widgets that will also work in the Canvas LMS environment. 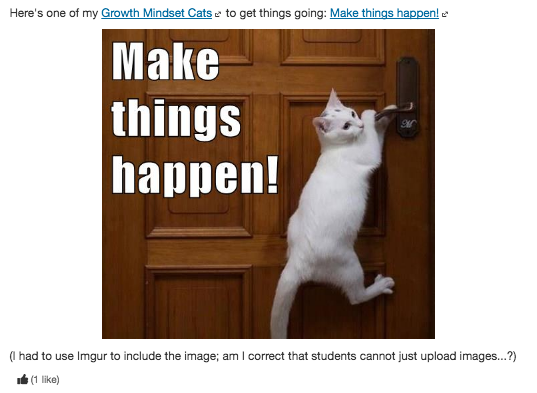 So, I can put this widget in the sidebar of my announcements blog if I want (although I think I will stick with the growth mindset cats), and it will display when embedded in Canvas. Thanks to the guys at OUCreate and Reclaim Hosting for this https superpower. It is something that has quickly become essential to how I design content for my classes! I've decided to start doing this biweekly since, alas, there's not a lot going on at Twitter. Maybe it will pick up in August! This morning I spent two hours building something REALLY cool: it is a randomizer for my Freebookapalooza library of free books. You can see it in action here: not bad for two hours of my time, eh? Try it! For each book you'll see links to online sources, an image, plus the table of contents below the image. You can see books from the Library at random, looking either at the whole Library or the different subsections, which relate to the subsections of the Myth-Folklore class that I teach. 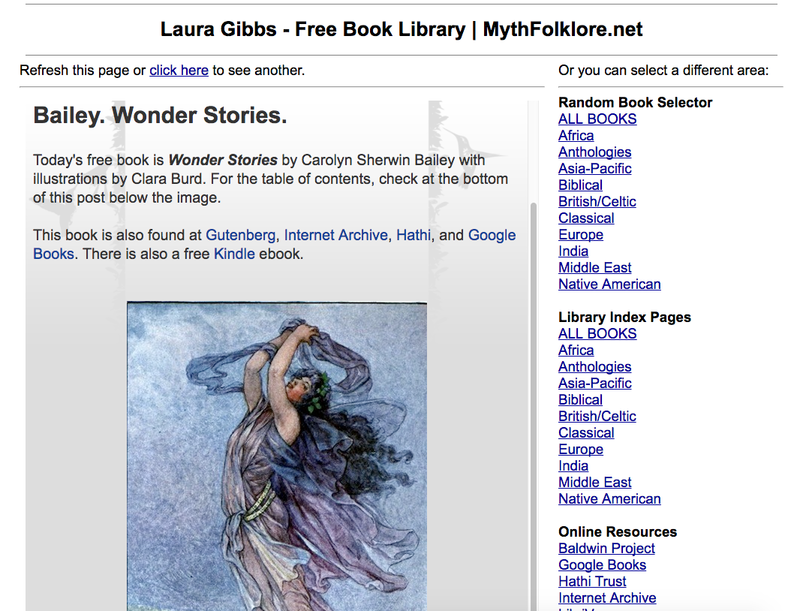 I also created a modified randomizer just for the India books that I can use in my Indian Epics class: Library.MythFolklore.net: India. So far, it looks like everything is working really well. If you notice something that doesn't look right, please let me know! I'm kind of suspicious that this all went so quickly and smoothly this morning... but I'm not complaining, ha ha. Even though this is the most complex randomizer I've ever built, it fell into place without a hitch. Easy peasy! This is really important to have because just giving students a list of books is not going to help them in exploring adventurously... and I really want my students to explore adventurously. This way they can browse through hundreds of books in a way that is both fun (random! you never know what's coming) and also useful because each blog post conveys way more information than just the title of the book. You'll notice that some books have an active table of contents where each story title links out to the story online at one of the available sites for the book, while others just have lists of titles. I'd like to go back and make more of those active tables of content: having instant access to a specific story is powerful! For now, though, I am focused on adding new books. Then, I can go back and improve each entry, working on the ones most likely to be of interest to my students. Blogger.com: This is where I create my content. I really like Blogger, and the nifty ?m=1 mobile view is what allowed me to display the individual book records separate from the rest of the blog layout. Google Sheets: This is where I have a simple three-column table that lists each blog post with the short title, URL, and category tag. 3. Highlight the part of the URL column for the category I am updating. 4. Copy the URLs into a text file. 5. Do a find-and-replace to add in the table-making HTML code in-between each URL. 6. Save the resulting file. Yes, I should learn to code. Or maybe I will see if my school will hire a student programmer next summer who could turn this kludge into a real program that other people could use for their own content management. Now THAT would be cool. I can definitely imagine this as a system that anybody could use to build an annotated online library for their class. Meanwhile, I am so happy that I have this randomizer to offer my students for Fall semester. Now I get to keep on adding books until I run out of summer! 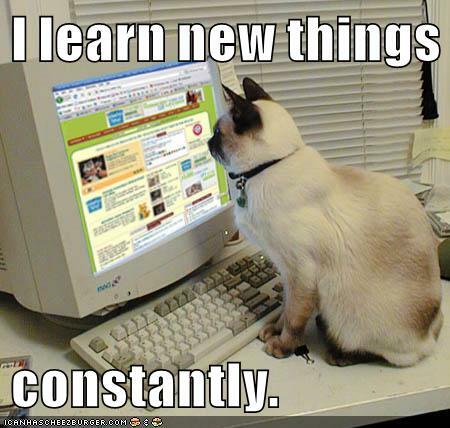 I learn new things constantly. After the Sigma Alpha Epsilon chant-on-the-bus (yes, it's a Wikipedia article now), there have been some important changes at the University of Oklahoma; you can read about those changes in articles like this one at the Tulsa World newspaper: OU to require diversity class for all incoming freshmen. And to see how much work there is still to do, just read the comments (shudder). Yet during this time of change, faculty have not received any mass email about changing the curriculum of our classes in order to bring more diversity into every class (and if it's not in an email at my school, it doesn't really exist...). Yes, our Center for Teaching Excellence has offered diversity programs, but no email message has gone out to ALL faculty explaining that, no matter what you teach, diversity and inclusion are important topics to work on. 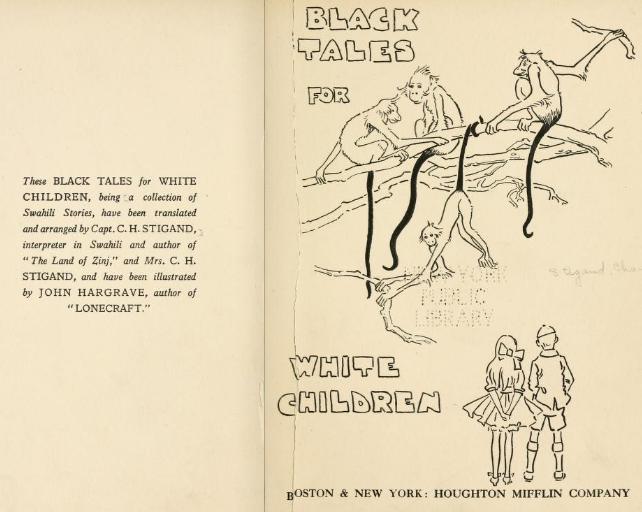 So, in an attempt to get some conversation going, I decided to write up a blog post about a project to expand the curriculum of my Myth-Folklore class. I'll describe that project here, and maybe others will chime in about their curriculum adventures this summer. It would be great to see some kind of conversation about curriculum diversity taking shape; it's a conversation that every single instructor could contribute to. Public Domain UnTextbook. 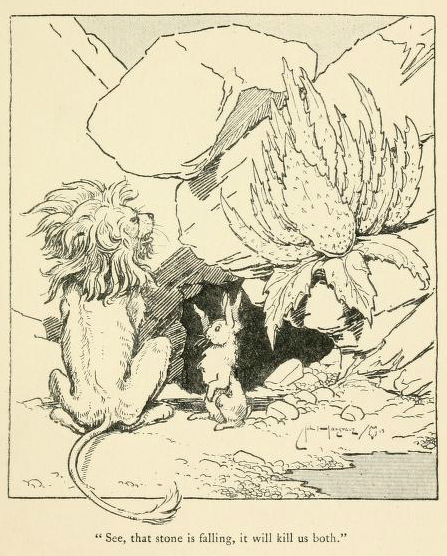 Ever since I started teaching the Myth-Folklore class, I've used free public domain texts online for the readings. The "UnTextbook" has a module dedicated to African and African-American readings, and students choose from 8 different topics; you can see how that works here: African and African-American Reading Options. It's good insofar as it goes... but I know it does not go far enough. Freebookapalooza. In addition to the books that I use in the UnTextbook, I also maintain a library of free online books that students can use for extra reading in the class and/or to do research for their class projects. This summer, I have been transferring the old version of that library (which was just a huge list of links sorted by category) to a new blog-based version where I am including the table of contents for each book. That greatly facilitates searching for specific contents, and it also makes it more fun to browse the library! You can see that blog here: Freebookapalooza. Curation. Although I have not provided detailed notes on the books, I have tried to provide a good starting blurb that can help students put the book in a cultural context (geographical, historical, etc.) with links to Wikipedia articles. I have also checked to see the different sources where the book is available online so that students can find free audiobooks at LibriVox, free ebook options at Amazon and Project Gutenberg, etc. based on their personal needs and preferences. In terms of reuse, the sites that provide digital text, like Sacred Texts, Gutenberg, and Project Baldwin, are more useful than those with just page images, like Internet Archive and Hathi Trust. By keeping track of the availability of the books at different online sources, I can increase the usefulness of the collection overall. Searching. 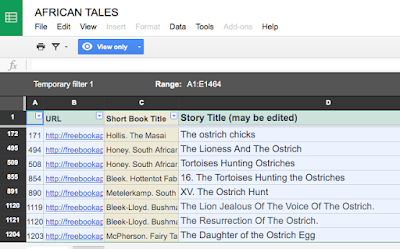 In addition to the book posts at the Freebookapalooza blog, I also built a public Google spreadsheet that anyone can use to sort and filter the story titles for each book. There are 1300 stories across those 40+ books, which is pretty amazing. 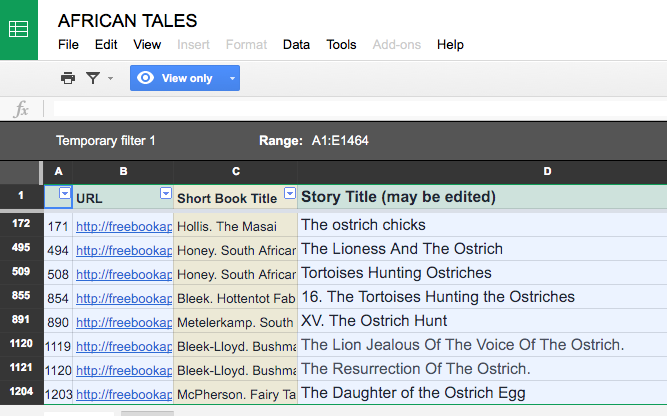 Here is the spreadsheet — African Stories — and any user can create a temporary filter view for searching and sorting. Next to each title is a link that leads to the blog post which provides information about the source book and available online editions. It just took about an hour to build this spreadsheet, and it is going to be so useful in future years, both for me and for the students too. Now that I see how useful this is and how easy it is to do, I will build spreadsheets like this for all the book regions. 1. Create a Diigo Library as well for better tagging and searching. Right now I have a Diigo Library for the UnTextbook, but not for the Freebookapalooza blog... yet. 2. Write up a tech tip to make sure students know how to create filter views at a public Google spreadsheet. 3. Do a similar book harvest for African-American books (I've got 11 books now, and I've already found 15 more to add). 4. Create some additional reading units for the UnTextbook from the best of the new books that I've found. Canvas and Content. As we are in the midst of a transition to the Canvas LMS right now, I wanted to remark on the fact that I have not done this content inside Canvas. Why? Because the Canvas wiki is just not ready for this kind of content development. With Blogger, I am able to create a project at any scale (the UnTextbook is a blog with over 2500 post pages... just try that in an LMS — eeeek! 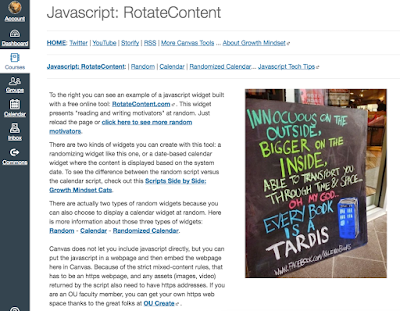 ), and if Blogger goes away, I'll move the content to another blogging platform (easy export). So, I hope that people who are looking at moving their classes to Canvas this summer will take a minute to think about the best ways to publish their class content online and share with others. 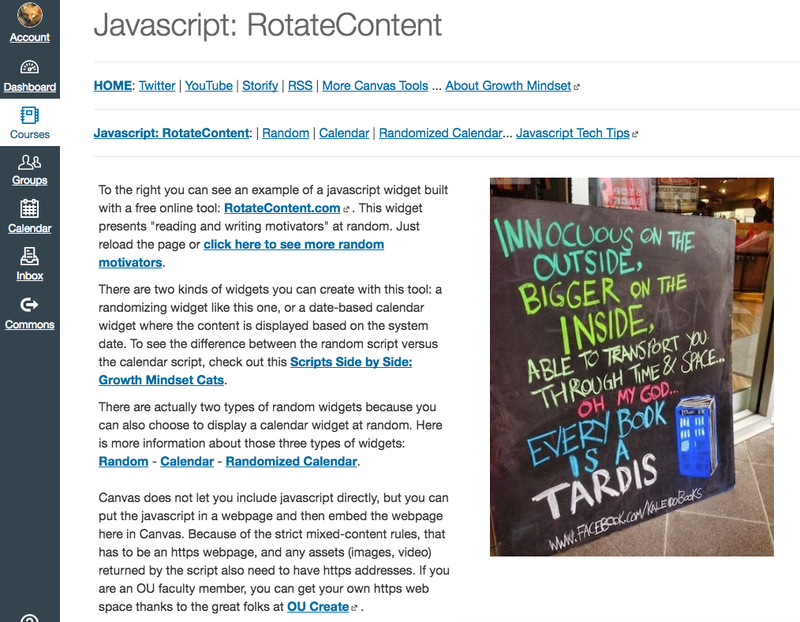 Now that we have OUCreate, there are all kinds of blogging and wiki options available: Create.ou.edu. 1. 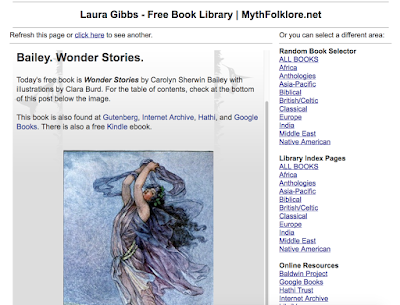 Public domain books are freely and instantly available. That is important if I want students to choose the books they want to read and to explore them without any limitations. Sure, I could find some really nice modern anthology of African folktales to order as a class textbook, but I far prefer this approach where I can present students with an abundance of books to choose from at no cost — besides the cost of time it takes to actually read the books of course, and asking the students for their time, if not their money, is already a lot to ask! 2. Digital books are searchable. By working with digital books — and, best of all, books with real digital text — I am able to build better search tools and help my students conduct effective research (see the spreadsheet above for just one example of digital literacy). I definitely want my students to learn how to work with digital texts as part of their learning experience in a fully online course. Expertise and Ignorance. Should I even be doing this if I am not an expert in African folklore? It's certainly easier to work on content in which you can be confident in your expertise, and that is not the case for me here. In fact, a big incentive for me in creating this collection was so that I can read and learn more. 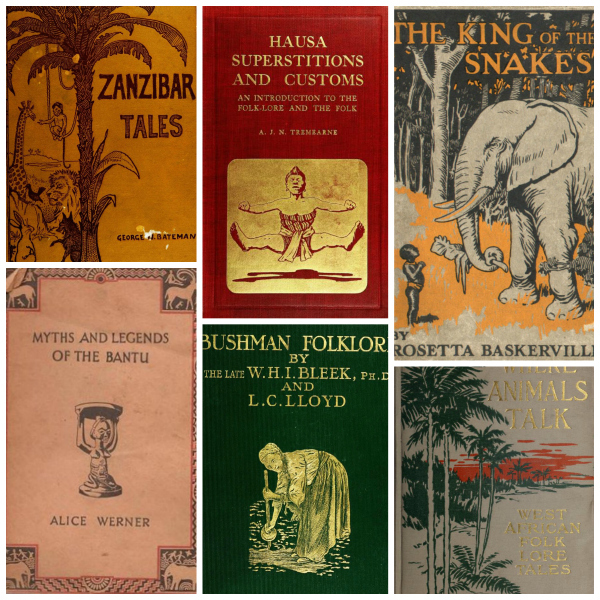 At the same time, I am building on some expertise that I do have, like knowing where to find public domain books online and also knowing how to curate and manage online content; I've also got a basic background in folklore and cultural anthropology. But here's the thing: expertise itself is part of a self-perpetuating problem; both my expertise and my ignorance are the products of racist schooling. It's no accident that I'm largely ignorant of African cultures, and it's a general problem we have not solved yet: when I ask my students how much they have studied Africa in school, they freely acknowledge that they have not learned much about Africa at all. So, if I were to focus only on my own expertise and leave Africa out of the curriculum of my class, I would risk reproducing the same racism that limited the curriculum of my own schooling, and my students' schooling too. So, in order to address diversity gaps in my class, I am going to have to confront my own ignorance and do something about it. My students and I both have a lot to learn, and I think we will all learn more if we are working on that together. Continuous Tinkering. The way I develop my classes is by continuous tinkering, kind of like the way there is always a paint crew working on repainting the Golden Gate Bridge; when they get to one end of the bridge, they go back and start painting again from the other side. It's never finished... and the most important thing to do is just keep on going. The appx. 30 hours I spent on this project was so much fun, and I am very curious to see what effects this will have on the class next year: for example, will more students choose to include stories from Africa in their class projects...? I think it would be great if that happened. There's a kind of default horizon of "Disney fairy tales" when students start the class, and if I can help people move beyond that default mode of what they know already, that is a big success. Plus, I include a free book recommendation in the class announcements every day, and next year I will have many more Africa books to include in those announcements. Every class is different, and only you know what would be the best ways to ramp up the diversity dimension of your class, including underrepresented topics to expand the learning horizon. I think that is a great question for every teacher to ponder, especially during the days of summer when we actually have the time to stop and think! Are you reworking your class as part of the Canvas transition? If so, share your thoughts about curriculum develop with the #OU2Canvas Twitter hashtag. Or the hashtag #BeforeYouLMS, since it could be that there are other tools, in addition to Canvas, that will help you broaden the horizons of your class. And now, speaking of other tools, I think it's time to start building a Diigo Library for these books. That's a fun task I can do while sipping some iced tea in the out-of-doors. Happy Summer, everybody!